The Deckhand Darlin Pirate costume includes dress with attached striped hip sash & belt. Our Deckhand Darlin comes in adult sizes Large, X-Large, Medium, Plus Size 3X, Plus Size 2X, Small. The included waist sash and matching head scarf complete this saucy pirate costume. 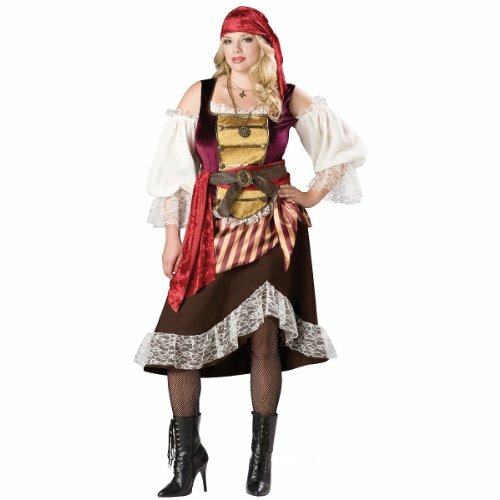 Piarte jewelry and pirate boots are available separately from this womens pirate wench costume. Please note: This item's color may vary due to inherent manufacturing variations or your computer monitor's color settings. The item you receive will be identical or substantially similar to the item pictured in this listing. The Deckhand Darlin Pirate costume includes dress with attached striped hip sash & belt. The Deckhand Darlin comes in adult sizes Large, X-Large, Medium, Plus Size 3X, Plus Size 2X, Small. The included waist sash and matching head scarf complete this saucy pirate costume. Piarte jewelry and pirate boots are available separately from this womens pirate wench costume. If you have any questions about this product by InCharacter, contact us by completing and submitting the form below. If you are looking for a specif part number, please include it with your message.